This refreshingly simple, practical guide demonstrates how brand management can boost business performance. It is the ideal inspiration for creating growth in today's tough economic times. Following the template of the highly successful original version, the book consists of a programme of 8 "workouts" that will help marketers raise their own game in key areas such as: insight, portfolio strategy, positioning and innovation. The tools and techniques in the book have been road-tested on over 100 brandgym projects out of the last 8 years, making this book extremely practical. Based on the inside stories of brand leaders who have achieved success: Tesco, T-Mobile, Unilever and Proctor and Gamble. These companies share their tips, tricks and warn of the traps to avoid. 50% of the content is new or updated with the latest thinking on "recession proof branding", how to win when times are tough, communication briefing, growing the core business and new research with marketing directors on the key success factors of brand leaders. The authors are most influential, appearing in The Guardian, Marketing, Brand Strategy, Market Leader and The Marketer. The CIM have called David Taylor one of the "World's 50 most important marketing thinkers". 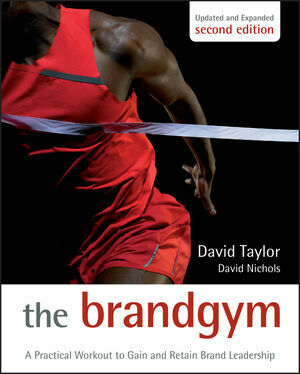 David Taylor and David Nichols are Managing Partners of the brandgym, a network of senior brand coaches that help teams to create a clear brand vision and the action plans to turn this into growth. Clients include SAB Miller, Tesco, Unilever, Cadbury, Coca-Cola, T-Mobile, Kerry Foods and RSA Insurance. Taylor has been named one of the world’s 50 leading marketing thinkers by the CIM. He is the author of three other brandgym books published by John Wiley: Brand Stretch, Brand Vision and Where’s the Sausage? He also writes brandgymblog.com, one of Europe’s top 10 branding blogs. David started his career in brand management with P&G before doing an MBA at INSEAD. He then started and grew the Paris office of Added Value, where he met David Nichols. David Nichols is a leading expert on innovation and the author of the brandgym book Return on Ideas – a practical guide to making innovation pay, in addition to Brands & Gaming published by Palgrave Macmillan. He started his career at OC&C Strategy consultants, moving on to the marketing consultancy Added Value where he was Managing Director of Australia and then the UK. He has a first class degree in Aerospace Engineering from Bristol University and is an aerobatic pilot in his spare time.